Punjab has been the land of poetry since times immemorial. 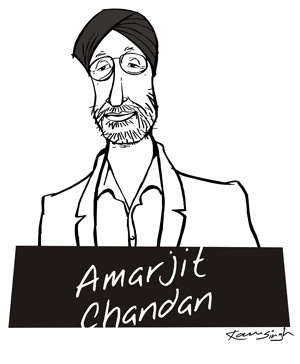 You, Mr Amarjit Chandan, have contributed substantially in carrying this rich poetic legacy forward. Your writing throbs with the collective cultural heritage of the united Punjab. You have been blessed with the gift of the word. You have nurtured this gift with an abiding adherence to a simplicity of expression, a deeply felt compassion and a disciplined diction. In your entire oeuvre – encompassing both poetry and prose – the reader experiences a purity of being. It is indeed an achievement to have coined a new literary idiom so unique and pure. You do not just write with language, you write with an authorial style. Suffused with the resonance of the sky, earth and the unknown, your creations are distinct in their essence. The universe you create in words is wondrously aesthetic in its elegance and beautiful in its humane warmth. Your poetry celebrates the spirit of the entire humanity and effortlessly traverses across cultures. Delving deep within the self, you have reflectively invoked the folk, the Sufic and the Gurbani traditions assimilating their philosophy and vision in a contemporary idiom. In your writings, the division between philosophy and poetry dissolves even as the world of Punjabi cultural memory opens up in a spontaneous and gentle evocation. The manner in which your poetry expresses and affirms the human and material relations is a signpost in the history of Punjabi literature. The innate simplicity with which you have represented the Punjabi language is a great achievement of your creativity. Your poetry has decisively earned an international space for your mother tongue, the Punjabi language, in the comity of world literature. Recognizing the inimitable service rendered by you to literature and to your mother tongue, the Anad Foundation on this day, the 22nd of November 2009, in New Delhi, confers upon you in humility and with gratitude the Anad Kav Sanman in memory of Bibi Baljit Kaur Tulsi.